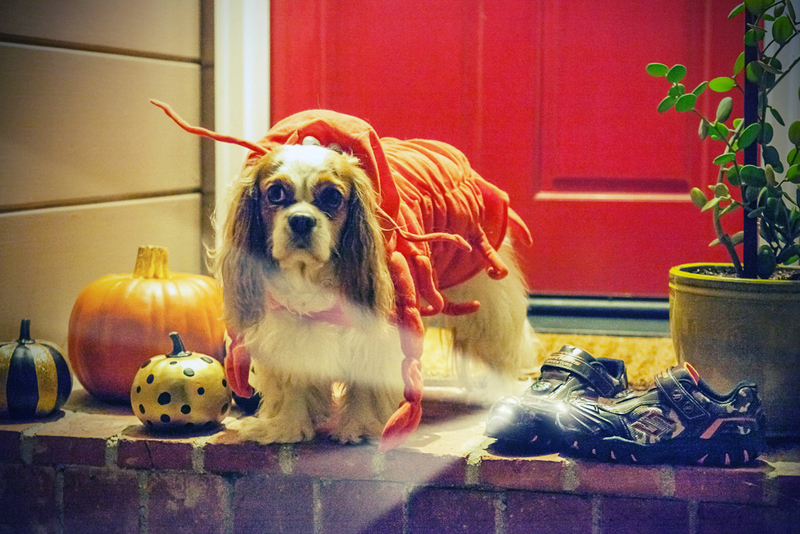 It’s that spooktacular time of year… Halloween’s one of our favorite holidays! There’s nothing better than seeing costumed kids racing down the sidewalks at night, scaring and screaming door-to-door as they load up on massive amounts of candy. 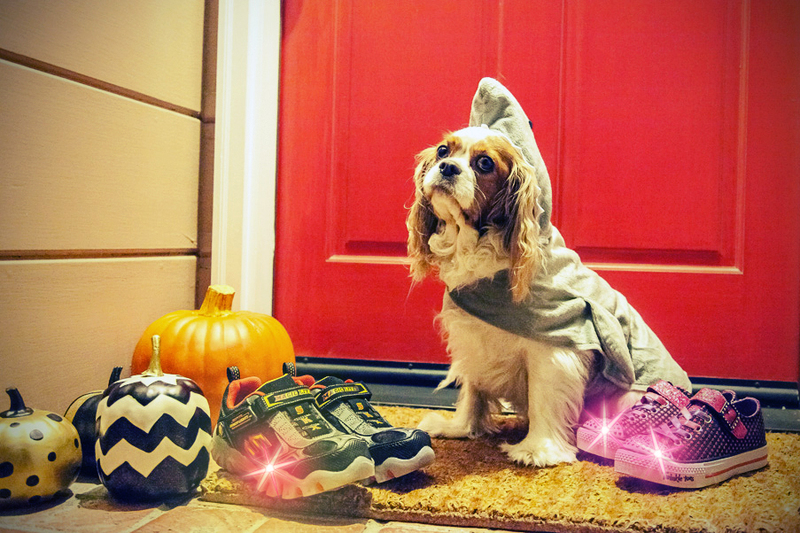 Here are our Skechers Kids merchandisers’ top picks for spooking and sparkling on Halloween. All are perfect for brightening up kids’ costumes (and are nice for lighting the way as night falls) as well as great styles for dressing up all year long. 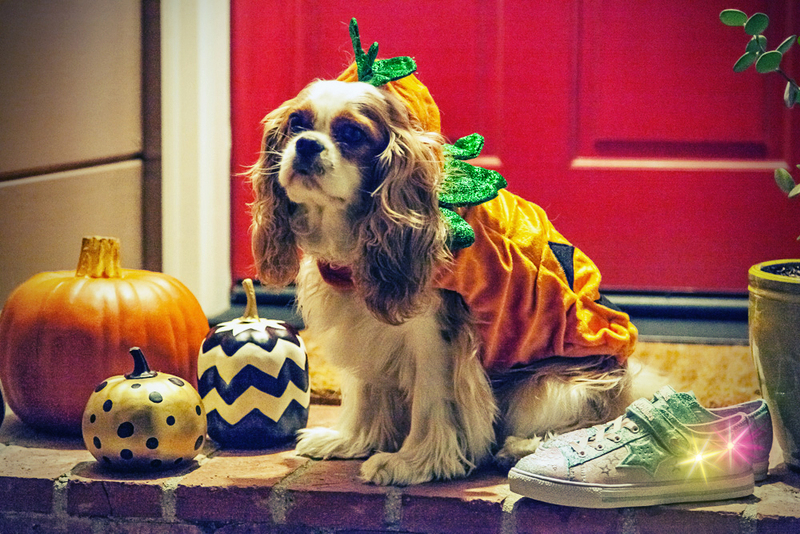 Check out these four popular looks (presented by none other than our favorite spaniel Poppy in three adorable costumes)! Every little fashion-forward girl needs something shiny and bright to complete her Halloween outfit. Skechers provides trend-right styles with signature lighted features that will fit perfectly with fun girly costumes. Twinkle Wishes are the “perfect fit” for a beautiful princess in a fancy gown on her way to a ball! This is a very pretty sneaker with light-up toe caps – and what makes it extra special is the magical sound that comes out of the star-shaped speaker. Just touch your toes together and whimsical music fills the room! Vibrant pastels, glitter details and satin materials make Twinkle Wishes the perfect comfy sneaker to play dress up in. This style’s also perfect for fun fairies, elegant ballerinas and enchanting mermaids. Nothing can stop him from trick or treating when he’s wearing Magic Lites – Street Lightz – Vroom! Whether your little one’s dressing up as a firefighter, animated superhero or lil’ demon, this versatile style is perfect for blazing a trail in a lot of different costumes. With the translucent sole and blinking colorful lights, he’ll be easy to spot in the dark. Every pair lights up with four different colors – two on each shoe! And the easy slip-in, single-strap feature makes putting them on a snap. One little girl costume that’s always a favorite every year is the traditional witch. A great witch outfit needs a few elements to complete the look: a broom, pointy hat and of course, the perfect pair of shoes. Twinkle Toes – Shuffles – Mysticals are the ideal choice! This classic black sneaker has sparkly pink stars, a rock glitter strap, fun buckle details and pretty satin bungee laces that make it witch-perfect. Plus its signature rhinestone toe caps help light up a fun-filled night. And the slip-on design means less time tying laces, and more time lighting up the path to Halloween fun! This year, your kiddos can navigate through the night with this Hot Lights Adventure shoe. With a functioning compass and a built-in color-changing flashlight, these cool camo sneaks will have your little explorer ready for any Halloween adventure! The front light switches from white to colors at the touch of a button – and they’re built rugged with lots of grip on the sole for your little one to treasure hunt, any time of year! Light up Halloween night with Hot Lights Adventure by Skechers. Ready to start scaring? Keep an eye out for our upcoming Halloween contest on Facebook and Twitter… Check back in on Friday for the details!